About Us-LongWay Battery Manufacturing Co., Ltd.
KaiYing Power Supply & Electrical Equip Co., Ltd. (LONGWAY Battery), established in 2000, with 50 million registered capitals, is specialized in the research, design, manufacture and sales of Valve Regulated Lead Acid (VRLA) battery. Our company located in Anxi, Fujian--the key area of Min Nan Golden Triangle. Now it is equipped with a 350 acres operation center, a 100,000 m2 factory. And it has expanded workforce to around 1000 employees. KaiYing is famous for LONGWAY Battery. Since establishment, KaiYing Power Supply & Electrical Equip Co., Ltd. dedicated in development of plates and batteries products。The company has strong technical force, advanced production, testing equipment, professional production of well-known brands LONGWAY battery. The company imported casting welding equipment, assembly line, acid machine, charging equipment, packaging lines and other advanced equipment, there are 9 battery assembly lines to complete a capacity of 80,000 batteries a day, the annual capacity of 600,000KVAh. With advanced equipment, the quality of LONGWAY Batteries is well controlled. LONGWAY batteries covered by the general AGM series(GB series), deep cycle series(DC series), narrow type series(FR series), high power series(HR series), Gel series(GEL series) , solar energy series(S series), nominal voltage 2V, 4V, 6V, 8V, 12V, 18V, 24V rated capacity 0.8AH~3000AH. The performance of the battery products are reached or exceed IEC, BS, JIS standards. The product has the advantages of high capacity, small size, long life, light weight etc.. Products are widely used in telecommunications, power, defense, railway, bank and the national trunk line network key engineering industries, and power ups,power EPS, electric tools, electric toys, battery sound and weighing equipment. Products are exported to Europe and America, Middle East, Southeast Asia and other countries and regions. Kaiying power supply & Electrical equip Co., Ltd. (Longwey battery) has been adopted by 2015 national Ministry of environmental protection, lead-acid battery access conditions for audit. Company determined to be the most complite enterprise in Lead-acid battery (0.8-24AH) series all around the world. The company has always been adhering to the science and technology enterprises, integrity-based, service-oriented business philosophy, consistently adhere to the "high quality, high energy and high efficiency, innovation and development for the market" quality policy and "law-abiding, pollution prevention, energy saving, the pursuit of environmental improvement" of environmental needle. 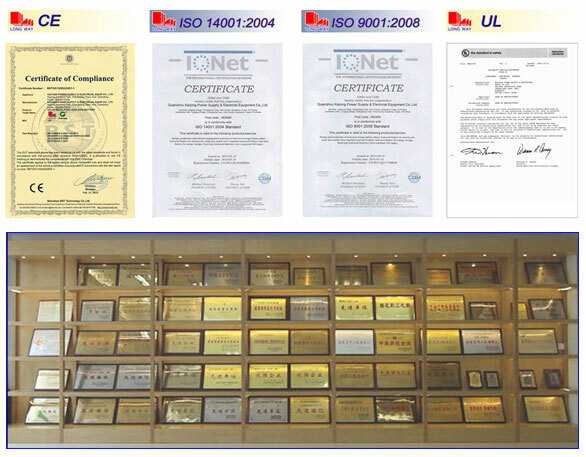 The company in 2005 passed the ISO9001 quality management system certification, ISO14001 environmental management system certification, the product passed the United States UL certification, the EU CE certification, etc.. The company has won high quality suppliers in China, Fujian Province famous trademark, Fujian Province famous brand products, Fujian Province the best credit enterprise, high-tech enterprises in Fujian, on both sides of the Taiwan Straits trading results will award and many other awards.